Yesterday morning I scored a ginormous pumpkin. Boxes of pumpkins sat in front of the local grocery with big fat FREE signs. Of course I grabbed the biggest monstrosity available and lugged it home for seeds. These garlic roasted ones are so simple and tasty my family gobbles them up before they’re cool. So why do I feel a sudden urge to go dumpster diving? Every year Clara begs me to make these same toasted pumpkin seeds. Print Recipe. 1. Place pumpkin seeds in the salted water bowl. Cover and refrigerate overnight. 2. Preheat oven to 350 degrees. Line a baking sheet with foil. 3. 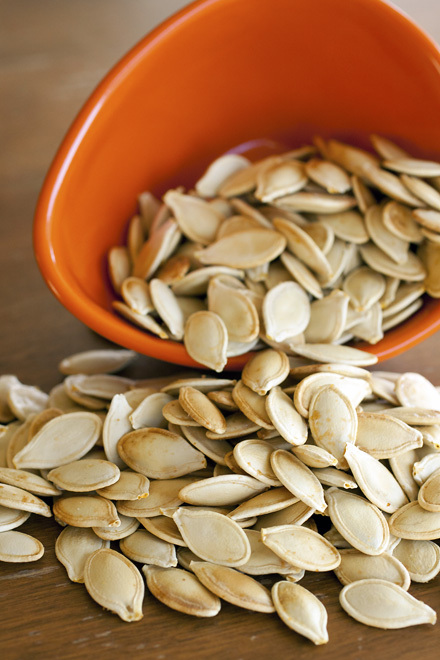 Strain and rinse pumpkin seeds. Place wet seeds on baking sheet. Spray with cooking spray. Season well with salt and garlic powder. Toss to coat. 4. Bake until dry and toasted, stirring every 10 minutes at first and every 5 minutes near the end. Cool and store in an airtight container. Yummy! Martha Stewart's magazine had parmesean pumpkin seeds, but I went traditional this year. I do regret not buying extra pumpkins for the seeds. Next year, I'll have to do a variety. I have never heard of these before, but they sound so good! I still have my pumpkins so I'll have to dig out the seeds and try this. Yum! What a great snack, huh? I love eating pumpkin seeds. Thank you for sharing, Laura. I hope you are doing well!